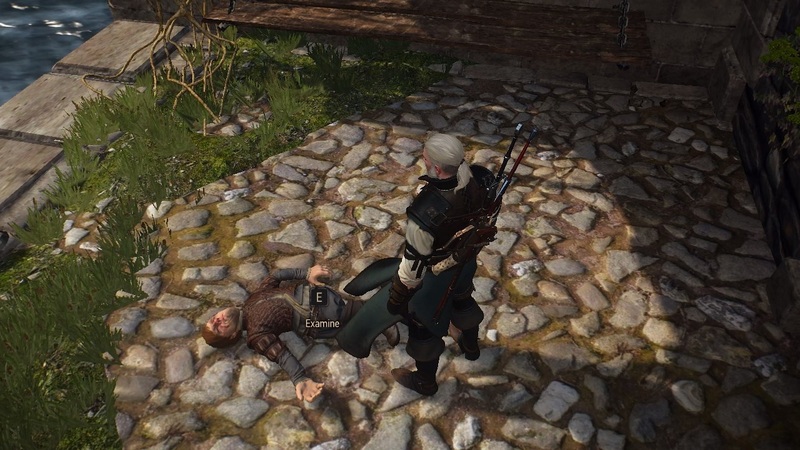 Five cool gaming and pop culture references in The Witcher 3. 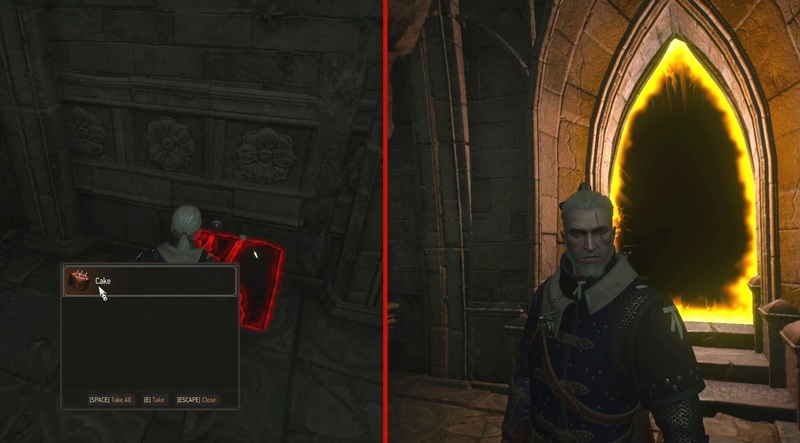 The developers at CDProjekt Red have a knack for hiding subtle video game and pop culture references within The Witcher 3. For this article, we’ve put together a brief list of several notable Easter eggs found throughout Velen and beyond. The developers have also really stepped up their Easter egg skills in the Blood and Wine expansion as well, so we’ve included a few from this DLC that are worth checking out. We have provided a brief description on how to find each of these Easter eggs in this list, which may include some quest names or details. Our descriptions are essentially spoiler free, but consider this your minor warning just in case. 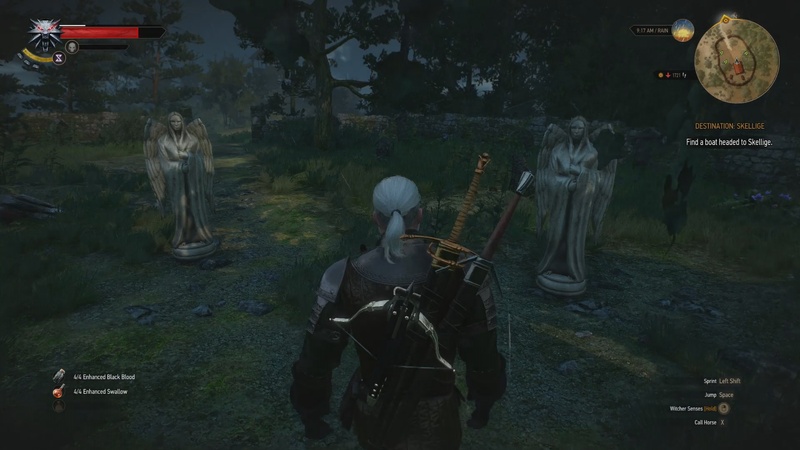 Dr. Who weeping angels in Witcher 3. There are several Easter eggs pertaining to Doctor Who within the Witcher 3, most of which are in references to space and time travel. However, the most interactive Doctor Who reference can be found near the village of Lindenvale. This Easter egg is a reference to the iconic Weeping Angels from Doctor Who, statue-like creatures that only move when they’re not being observed. Travel to Lindenvale in Velen, and look for a graveyard just outside of the village. When you enter the graveyard, you’ll see a mausoleum in the center with two angel statues out front. Enter the mausoleum, then turn around and prepare to leave. As you exit, notice that the two angel statues have changed position, and are now facing you. Try not to blink! This dwarf bears a striking resemblance to Tyrion Lannister from Game of Thrones. Considering the popularity of Game of Thrones, it comes as no surprise that the Witcher 3 would incorporate several references to the hit television show and book series. One of the most notable of these GoT Easter eggs can be found in the Skellige Isles, on the small island of Kaer Almhult. Investigate one of the bar-free prison cells to find the corpse of a dead dwarf laying on the ground with a facial scar similar to Tyrion Lannister’s in Game of Thrones. As Geralt examines the body, he mutters, “Sky cells…nice idea for a prison without bars. Shame he didn’t know how to fly.” Though he survived prison in the show, this is a clear reference to Tyrion’s brief time locked up in The Eyrie. This Dark Souls styled bonfire is found later in the Blood and Wine DLC. There are a ton of Easter eggs in the Blood and Wine expansion alone, so we chose a few notable ones to add to this list. One of the most recognizable of these references is an interactive Dark Souls bonfire that can be found in one of the last main story quests, titled Beyond Hill and Dale. To find the bonfire, you must first defeat the giant boss. Approach the castle, but don’t go inside. Instead, vault over the railing on the left side when facing the castle. Drop down to the ledge below and follow the footpath leading to a cave. Inside, you’ll find a bonfire with a sword sticking out, just begging to be lit. 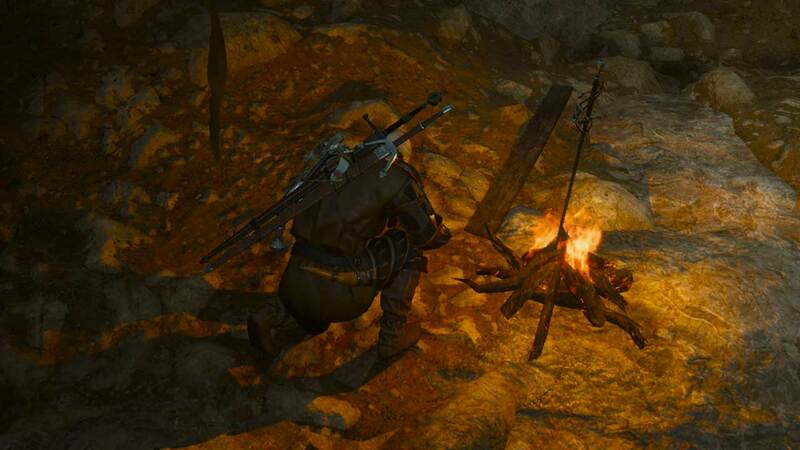 Upon igniting the bonfire, Geralt will kneel down beside it like you would in Dark Souls. There’s a powerful Gesheft sword you can take from the fire as well, so don’t leave empty-handed. This Portal-themed room features a companion cube, cake, and orange portal. The Blood and Wine expansion also features a full room that contains several references to the iconic puzzle game, Portal. This room can be found during a secondary quest titled “Turn and Face the Strange,” which becomes available after completing an early part of the Blood and Wine main story quest. Begin the quest after receiving a letter in Beauclair. You’ll eventually reach a puzzle that requires you to navigate through a series of portals. When you reach the section with three floors of portals, drop down off the left railing onto the second walkway, and enter the portal behind you. This room contains a box in the center resembling a companion cube, a familiar cake in the chest, and the only orange-to-blue portal in the area. 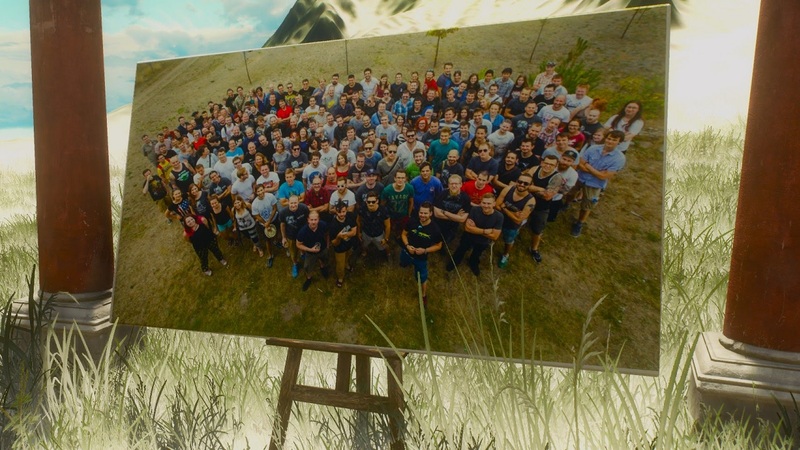 A secret group photo of the CDProjekt development team, found atop Mount Gorgon. Okay, this one is less of an Easter egg and more of a nifty little treat from the developers. High upon Mount Gorgon, you’ll find a lone blank canvas and easel. The only way to reach this mountain is by using a free-camera mod that allows you to teleport Geralt to the top. Once you’re there, approach the canvas and use your Witcher senses to reveal a hidden painting. The image is of none other than the CDProjekt development team.